This is a review of the rare region-free DVD edition of this movie. Little Fauss and Big Halsy is a story of brave men and beautiful women. 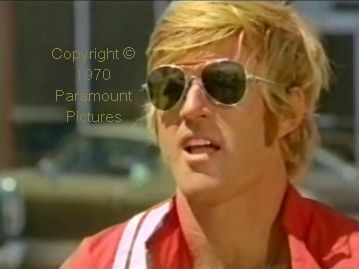 Specifically, it is the story of a friendship between two motorcycle racers in the late 1960s, Little Fauss, played by Michael J. Pollard, and Halsy Knox, played by Robert Redford. It is also a story about several women they meet, most notably recovering drug or alcohol addict Rita Nebraska, played by Lauren Hutton. Halsy Knox is not your father’s hero either. While he embodies the physical traits one expects of young men in the proverbial front rank, he also has some major character flaws — or what were once thought of as character flaws. 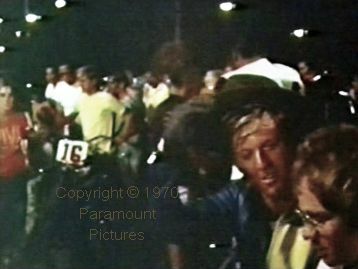 After the movie’s opening race, Fauss has his photo taken at the insistence of his mother, who does not have a photo of her son, at least not in racing leathers. Notice Fauss’s expression in the screenshot. His mother wants him to smile for the camera, but the freelance photographer triggers Fauss’s dodgy geezer antennae in a way that the outwardly more devious Knox does not. 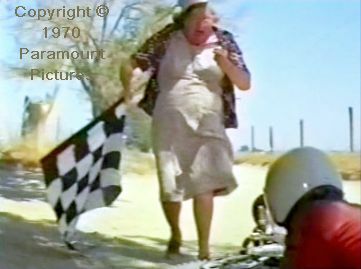 The movie includes real race preparations. And some unreal preparations. Knox sees a blond girl in a bikini hanging around the starting area. He grins at her and stuffs a hand down his pants suggestively. She smiles back and looks down shyly. You get to see a lot of this stretch of desert. 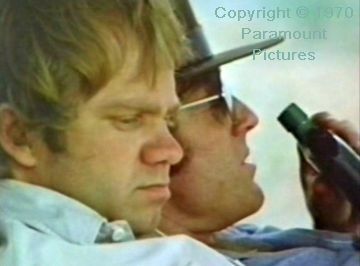 The acting, including by Pollard and Redford, is (in my opinion) extremely good. 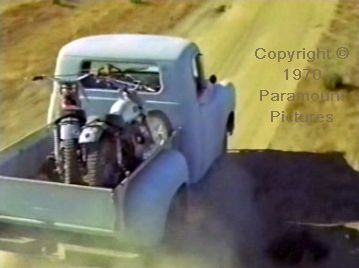 For example, when Fauss encounters Knox in the motorcycle and parts store where Fauss works, you could gain the impression that Fauss is a shallow individual easily manipulated by Knox’s social skills. However, later, Fauss listens to his parents’ concerns about his new friend before replying with a thoughtful critique of his own, demonstrating that he sees beyond Knox’s superficial exterior. 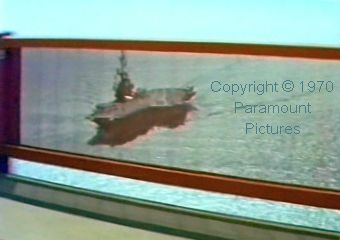 OK, it is good script writing, but Pollard seems to really be Fauss rather than an actor playing a part. Incidentally, this out-of-character sequence reflects (possibly inadvertently) the belief that action sports are good for people’s development of character and should be encouraged. It is a shame that belief has given way to today’s brave new world of mass entertainment, ‘social media’, and dog walking as the only approved lifestyles. Knox recounts to his woman the story of how he really acquired the immense scar on his back. She does not respond the way he wants and he complains that, even when he tells the truth, she does not listen, so what good is the truth? However, Knox later tells a different story of how he really acquired the scar! This is what puzzles many honest people about compulsive liars: How do they keep track so as to avoid being tripped up? Retrospective reality is fixed, yet hard to always remember accurately, but fiction is almost infinite! This story illustrates Knox’s method, which seems to me plausible. He does not attempt to create a consistent fiction. He just tells another lie. When someone points out the discrepancy, he either ignores it or admits to having got it wrong – and invents an even bigger lie that encompasses his previous fictions. The American war in Vietnam was in progress – including the draft of young men like Fauss and Knox into the armed forces. Incidentally, both are drafted; one before the story starts and the other near the end. They each react differently and characteristically to the draft. The challenge for an ambitious and able young fellow then, as now, is how to stand out from the crowd – to succeed – to establish (in the eyes of attractive women of course) one’s superiority to other men. (The first Apollo moon landing was made at about this time, so the bar was set fairly high.) Off-road motorcycle sport was that mechanism for many young men in the USA and where I live in Britain. (It also applied in Europe and doubtless in other advanced societies.) Unfortunately, you had to be both a good rider and a good mechanic, or you needed a newer bike that only the wealthy could afford. Fauss, who at least has mechanical ability, and Knox, who does not, are both caught in that struggle. They attempt to overcome various obstacles by joining forces. The film features a range of different kinds of motorcycle racing from desert enduro to road racing. 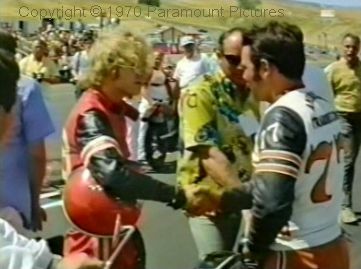 (This was the era of Gary Nixon, Cal Rayborn, and Gene Romero.) It even includes a hill climb. Later in the story, Knox explains that he sees his apparent success with women differently from the way Fauss sees it. While I have some criticisms of the filming, the daylight racing shots show some scenic bike racing action. 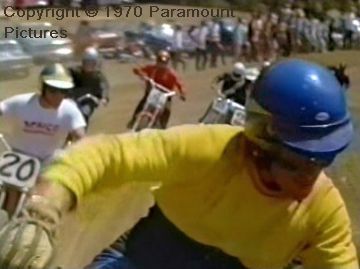 The makers of the film clearly put some effort into conveying the excitement of bike racing, including mounting cameras on bikes and staging reasonably realistic action. 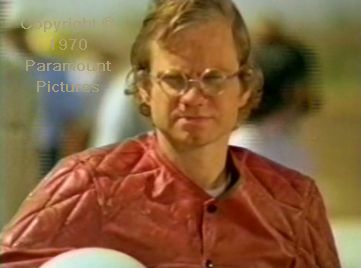 In the accompanying screenshot, the rider is either Redford or someone who looks a lot like him. Fauss bluntly criticises Knox’s riding. We do not generally worry about things that do not concern us personally, so it is safe to assume that Fauss sees the same faults in his own riding and takes care to avoid them in future. The predictable consequences of that are made evident in the final moments of the film. However, it seems to me that other (later) possible consequences of his interaction with Knox are left to the viewer to imagine. Eventually, Fauss grows tired of Knox’s company. For one thing, while Knox gets off with a succession of girls, when is he (Fauss) to get a look in? I hope I am not giving away too much of the plot by stating that the friendship ends and the two men go their separate ways, although they continue to meet at races. At that point in the story, the action shifts from off-road to tarmac track racing. An indeterminate time later (and doubtless several pairs of spectacles later) Fauss’s mother uses a stopwatch to time Little in practice rides outside their home. (The scene reminds me of my old mum coming to see what happened to me when I was de-rigging my hang glider at dusk after a day’s flying at my local hill in the spring of 1975. 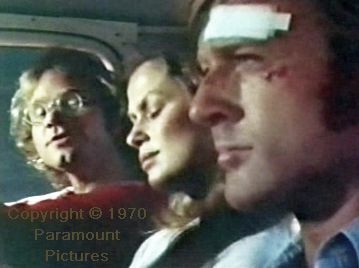 Being out alone at night with a broken leg – which is exactly what happens to Fauss earlier in the story – would be dangerous indeed.) During this practice session, Knox stops by. He is out to take advantage again. (But – Edward O. Wilson’s latest theories notwithstanding — don’t we do everything for advantage?) He asks Fauss how his father is and seems genuinely shocked at the reply. Digression: Whether riding off-road motorcycles or flying hang gliders, we Brits do so in the knowledge that, if we are injured, the machinery of the state medical service takes care of us. Perhaps strangely, a similar mechanism seems to be at work in the supposedly business-driven USA, at least according to this film. First, when Fauss sustains a fractured leg, he is fixed up by a doctor. In the scene I refer to here, the patient is looked after in a hospital that, although modern (that is, late 1960s modern) gives a strong impression of being run by charity. So different from Britain, yet so similar. The story has a twist near the end, which indirectly follows the ‘sexual contract’ theory. (See my digression, Sexual contract.) 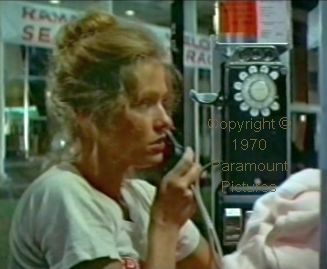 Again, I am being obscure so as not to give away the plot, but Rita is in a telephone call box near a motorcycle racing circuit in northern California, speaking to a female telephone exchange operator (remember them?) who instructs her to insert 75 cents, which she does. 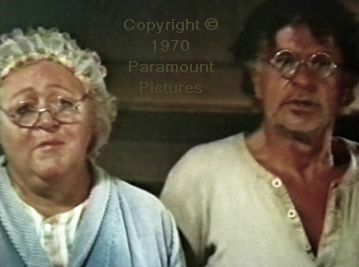 That is her last appearance in the film. Towards the end of the story, one of the two heroes does what is nowadays referred to as reinventing himself. It strikes me that there is more to that than might appear. The story ends before any long term consequences can develop, but I know one individual who, adopting the behaviours of outwardly more successful people, but that were contrary to his own nature, developed an extreme case of paranoid schizophrenia. It eventually landed him in a secure psychiatric hospital. What I at first thought of as a fault – that you get to see a lot of the same stretch of desert track alongside electricity pylons and they keep halting their truck at the same dusty road junction beside a railway line – might well be deliberate. “It’s like you never went nowhere at all,” comments Knox to Fauss about their travels. 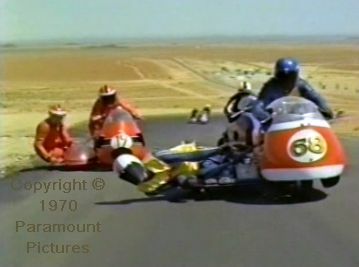 As far as I recall, motorcycle racers rarely change from motocross to road racing or from solo to sidecar. However, to have the main characters do that is a convenient way to showcase these different aspects of motorcycle sport. 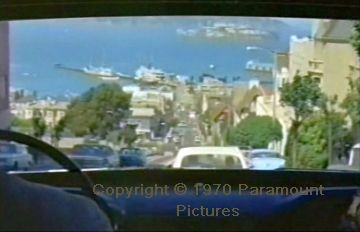 The filming is often too tightly framed for my taste, by which I mean it is too zoomed in, which gives it somewhat the low budget feel of a ‘made for TV’ movie, which it is not. It imparts a constricted feel in which I want to know what is to left and right and around about. For example, we are somewhere along a long dusty track, apparently in the proverbial middle of nowhere. Then, we discover we are right outside the Fauss residence (which is not saying much, to be fair). However, there might be a method there. What could offer more freedom than living in the wilds of southern California? Paradoxically, the daily grind and humdrum of everyday life occupies all of one’s attention, even there. (Regardless of where you live, when did you last look at the moon through binoculars?) In addition, we do not notice things familiar to us, such as where we live, so maybe the tight framing is an attempt to convey that. Nevertheless, I found it annoying at times. Apparently, the title song by Johnny Cash won an award. All I can say about that is that 1970 must have been a slow year for whatever category of music the award was for. Ghost Riders in the Sky it is not. Neither Fauss nor Knox are cardboard cut-out caricatures of action sportsmen. They are both complex and contradictory enough to create new conundrums, expound ideas, and demonstrate refreshing insights at every turn. 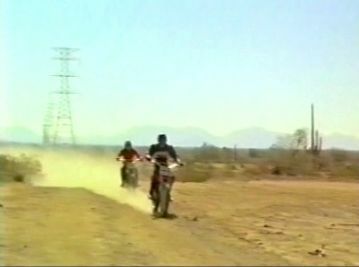 The movie was made before the common man (and woman) urged their political representatives to close off-road biking areas both in Britain and the USA. One result of that closure is that the late 1960s and early 1970s are regarded by many as a golden age of off-road biking. 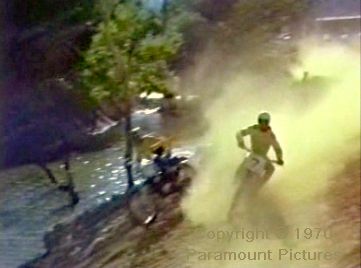 Bike racing movies are rare anyway, especially dirt bike movies, so this film (along with the Steve McQueen documentary On Any Sunday) records important aspects of ‘first world’ life in the 20th century. The film cannot help being interpreted as commentary on American society and, therefore, commentary on all western ‘first world’ societies. For example, Fauss, Knox, and Rita sit beside a ‘nodding donkey’ oil well that casually spills ‘black gold’ while slowly and automatically turning its Dallas owners into millionaires. Automation was supposed to free the people from the shackles of labour so that young men can compete for the attentions of young women in the fields of sport, science, art, and literature. That it has done. But only some people. The genetically catastrophic result is that, nowadays, men compete for the attentions of women in the fields of deviousness, moneymaking, and social skills. Brits of my generation look up to the USA as a land of snow-capped mountains, forested hills, and desert canyons — as well as modern cities – all populated by astronauts who spend their weekends hang gliding and air stewardesses who, in their free time, wait with refreshments ready in the landing zones. (I exaggerate of course.) However, this film paints a different picture. It is a view that accords more with observations by Americans touring Britain and Europe that I have heard and read, where they are amazed at how the scenery and weather change every few miles. (Brits like me don’t know any different.) 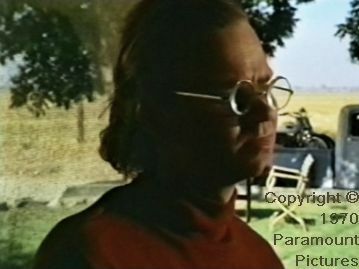 The monotonous desert and farmland scenery of Fauss and Knox’s part of the USA is conveyed both by the filming and by Knox’s complaint to Fauss that they travel endlessly, yet everywhere is the same. Another digression: The story is also one of a man overcoming his physical limitations and another failing to overcome his character limitations. 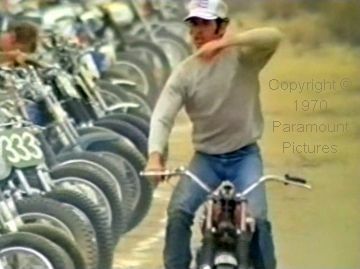 I do not know whether Fauss is based on a real individual, but, in the supporting material accompanying the Steve McQueen funded documentary On Any Sunday, one rider explains his technique of looking back to see who was behind him on bends: He ducked his head down and looked under his inside arm. Soon, other riders copied the technique and, for a while, it became quite the fashion in American motorcycle races. However, his reason for doing so was that, being blind in one eye, it was the only way he could look behind in that direction! Hero to Zero, about another ‘tries harder’ guy with poor eyesight, but great intelligence combined with strength of character. It is set in Japan during the earlier half of the 20th century, where high technology rubbed shoulders with extreme poverty.